You just never know how kids will respond when you ask a question. 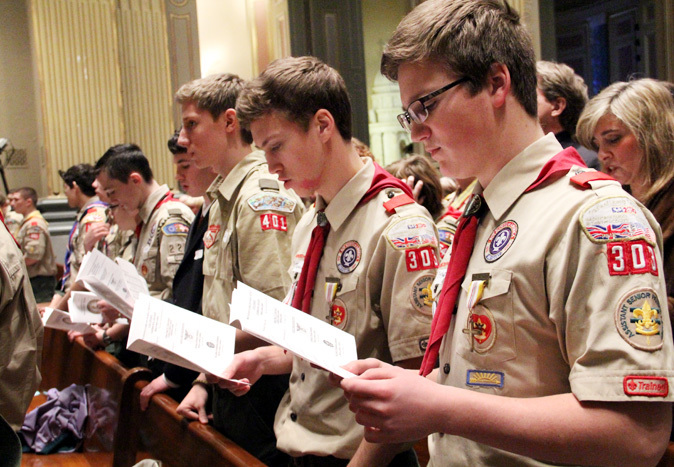 The annual Boy Scout Mass held at the Cathedral Basilica of SS. Peter and Paul on Saturday, Feb. 1 included the first reading from the second book of Samuel — the admonition given to King David by the prophet, Nathan for stealing another man’s wife. One young Cub Scout raised his hand. “A prophet is making money off of something else,” he said. “That is a very good American answer, but it isn’t it,” the archbishop said, explaining the difference between prophet and profit. “A prophet is someone who preaches the Word of God,” he said. In the same way that David repented after being rebuked by Nathan, “The sign of being a real man is to admit your faults and ask forgiveness of God and others,” the archbishop said. Traditionally, the Scout Mass precedes an award ceremony, where the scouts at all levels and also leaders receive awards for combining their faith with scouting. 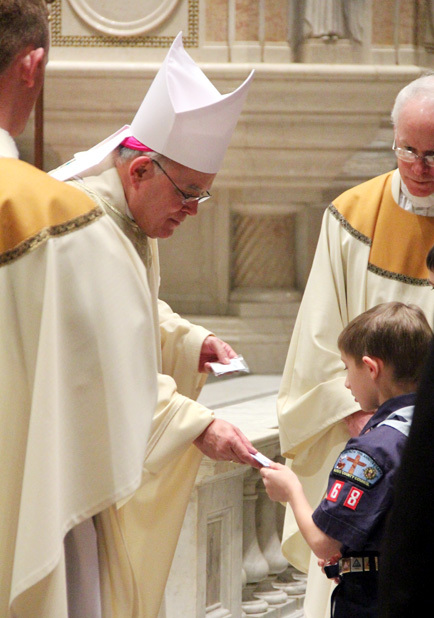 A Cub Scout from Troop 500 of St. Anne Parish in Philadelphia receives Communion with excitement at the Scout Mass. In all, there were 231 awards granted in the fast-moving ceremony that followed the Mass. The largest group by far was Cub Scouts receiving the Parvuli Dei (Children of God) emblem with 144 awardees. “I’m excited and I’m proud,” said Tyler Carter, a shy Cub Scout from St. Francis de Sales Parish, Philadelphia, who struggles with autism but nevertheless has found a home in scouting. On the older end of the scale was Eagle Scout Daniel Turner, of Our Lady of Fatima Parish, Bensalem, who received the Pius XII Award. For his Eagle project he raised $1,600 to obtain benches and along with his scouting friends beautify the exterior of his parish grounds. “Scouting keeps you well-rounded and has a spiritual impact on your life,” he said. 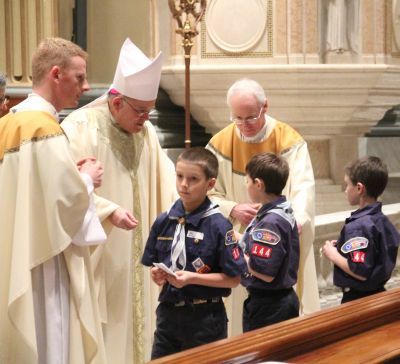 Cub Scouts of Troop 144 from Our Lady of Good Counsel Parish in Southampton receive awards from Archbishop Chaput as Father John Ames, right, and Father David Friel assist. Really exemplifying the spiritual side of scouting was Alex Pancoast, from St. Ephrem, Bensalem, who is now a college senior at St. Charles Borromeo Seminary. He received the Bronze Pelican Emblem for his continued service with the Bucks County Council. He is not alone; vocations directors, take note. “We have four Eagle Scouts in my class at St. Charles,” he said. 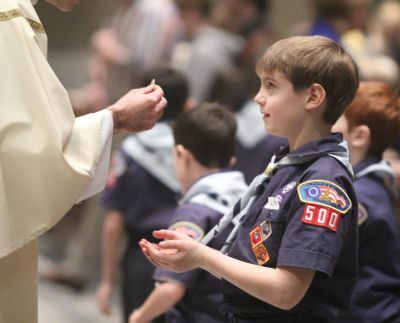 “There are really a lot of opportunities for boys to do something in scouting with the church,” commented Father David Friel, who is Archdiocesan Chaplain for Scouting. “I’m glad they are taking advantage of those opportunities,” he said. 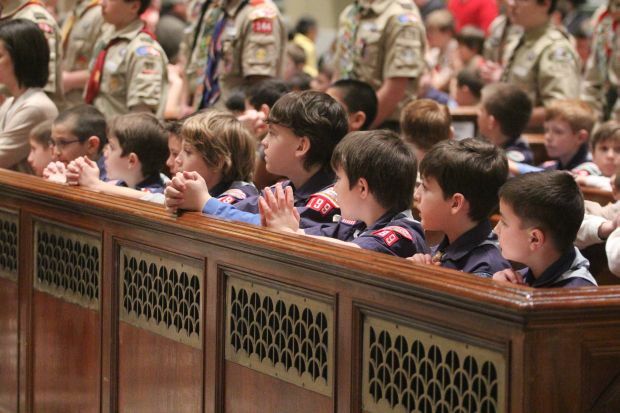 Boys receive Communion at the Scout Mass Feb. 1 at the Cathedral Basilica of SS. Peter and Paul.